Fire-breathing performance, damn cold temperatures. Ever since the monstrous $700 GeForce GTX 1080 Ti launched, the world’s been waiting to see what this beastly GPU was capable of in the hands of Nvidia’s hardware partners. The Founders Edition delivered damn near uncompromising 60-fps performance at 4K resolution with everything cranked to 11, and that was with a lowly reference cooler and stock clock speeds. How far can factory-overclocked versions with potent custom cooling solutions go? Well, for the first time ever, a graphics card is so damn fast that it managed to largely push a game’s bottleneck off of the GPU and onto the CPU in PCWorld’s ferocious testing PC—while running 15 degrees or more cooler than the Founders Edition. And the EVGA GTX 1080 Ti SC2 ($720 preorder on Amazon) isn’t even EVGA’s fastest custom GTX 1080 Ti. Before we dive into the customizations EVGA made to the SC2, here’s a refresher on the GTX 1080 Ti’s default technical specs, built around the full-fat version of Nvidia’s GP102 graphics processor. The major difference under the hood of EVGA’s card is the GPU clock speed. The GTX 1080 Ti SC2 hums along at a 1,556MHz base clock and 1,670MHz boost clock. That’s a healthy 88MHz leap over the GTX 1080 Ti Founders Edition boost clock—heck, the EVGA card’s base clock is a mere 26MHz away from the stock version’s boost clock. The numbers aren’t as concrete as they seem, however, as the GTX 1080 Ti regularly surpasses its rated boost clock anyway. Before performing any additional overclocking, we saw EVGA’s card hit clock speeds up to 1,850MHz in some games, depending on what was happening on-screen. The memory’s untouched compared to the reference version, with a borderline excessive 11GB of GDDR5X of onboard RAM. The cooling solution is anything but. You’ll notice EVGA’s new shroud design first. With the GTX 1080 Ti lineup, the company’s ditched the solid exterior found in its customized GTX 1080 models for a porous new aesthetic that shows the beefy heatsink lurking underneath. The look’s been somewhat divisive in forums but I dig it, not least of which because it shows the true star of the show here: EVGA’s ambitious iCX cooling setup. We went hands-on with EVGA’s revolutionary iCX when it debuted in the GTX 1080 FTW2 earlier this year, and it’s worth highlighting again. Graphics cards have traditionally only featured a single temperature sensor, monitoring the GPU processor itself. EVGA’s iCX loads the card with not one, not two, but nine additional sensors that also monitors the rear of the GPU, the onboard memory modules, and the power controllers. Virtually every aspect of your graphics card is tracked. 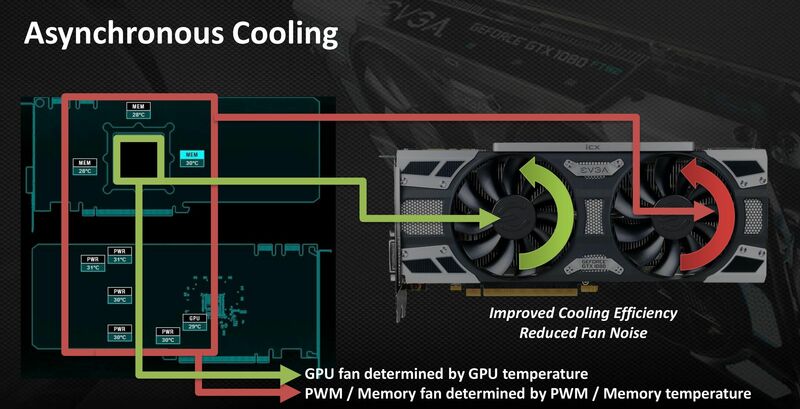 How EVGA’s iCX cooling technology works. But iCX does more than simply track temperatures. 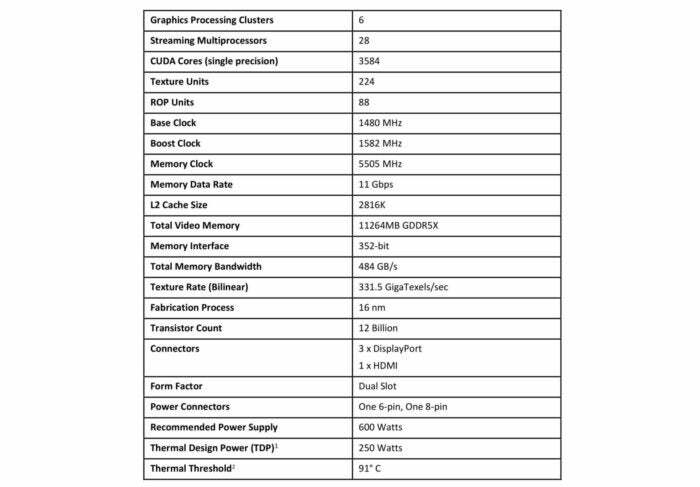 It uses that comprehensive data to control the speeds of the dual fans independently, with the leftmost fan responding to the GPU temperature, and the right-side fan adjusting speeds to keep the memory and PWMs cool. If the memory’s heating up rapidly but the GPU itself is staying relatively cool, as can happen with the Furmark stress test, the dedicated GPU fan maintains a slower, quieter speed, while the memory fan ramps up. 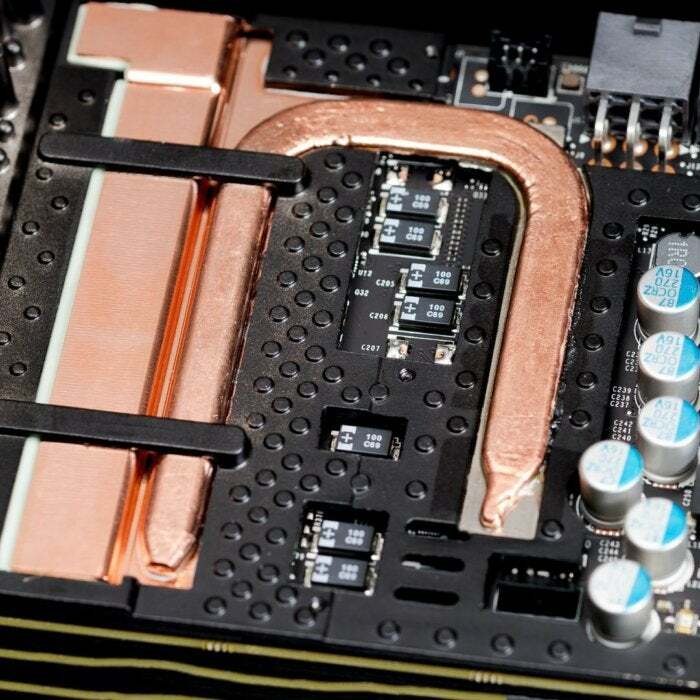 The copper VRM heatpipe integrated in the GTX 1080 Ti’s redesigned baseplate. EVGA’s tweaked the VRM heatpipe design on iCX-equipped GTX 1080 Ti cards as well, to help keep temperatures even lower. You can monitor your temperatures sensor-by-sensor in EVGA’s Precision XOC software, or just by glancing at the graphics card in your case. Three RGB lights above the EVGA GTX 1080 Ti SC2’s logo on the card's edge indicate how hot your GPU, PWMs, and memory are, respectively. As components heat up, the individual lights change color (not that you’ll have to worry about it much with this card). Precision XOC lets you customize the colors of the EVGA logo as well as the RGB indicators. 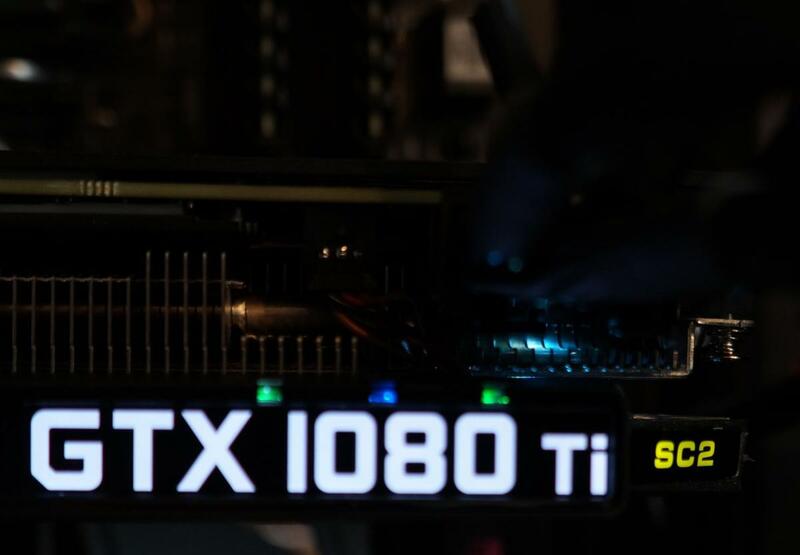 The colored lights over the “1080” show how hot your hardware’s running. It feels like the future of cooling, and it’s stunningly effective in practice. It’s nice seeing RGB lights being used to practical effects, as well. 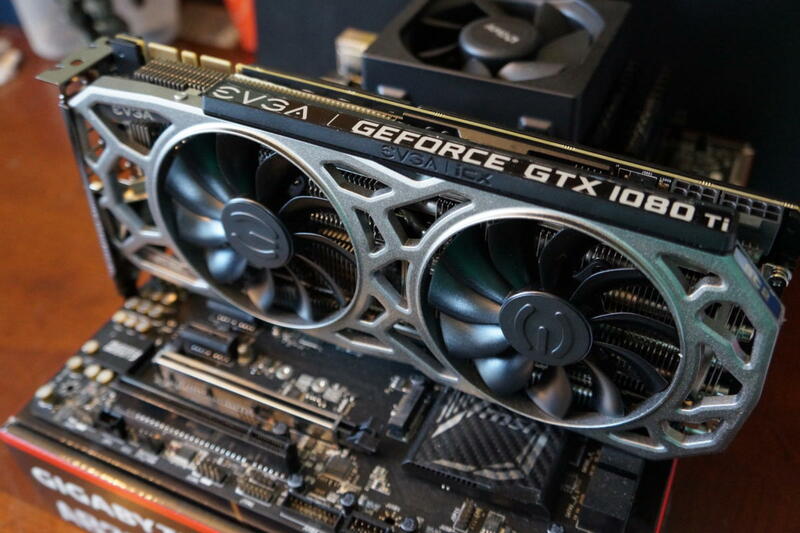 Most custom GTX 1080 Ti cards released thus far have used thicker 2.5- or 3-slot designs to keep the GPU tamed, but EVGA’s card sticks to a traditional 2-slot size, so it’ll be interesting to see how iCX holds up in games. As far as the rest of the card goes, the EVGA GTX 1080 Ti SC2 features a sturdy backplate, as you’d expect in a graphics card this pricey. Despite its higher clock speeds, the card still harbors the same 250-watt TDP as the Founders Edition, and the same 8-pin and 6-pin power connectors. 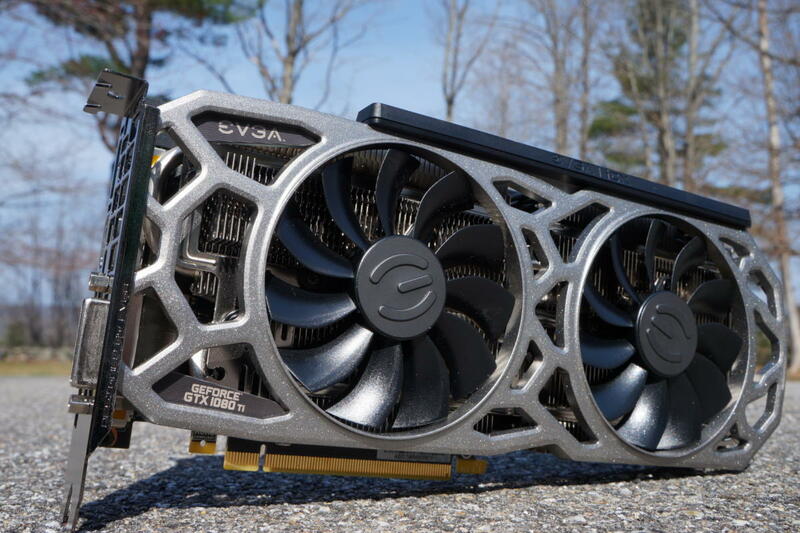 EVGA’s internal 7+2 power phases will help you push the GPU to even faster speeds. There’s one final tweak of note. 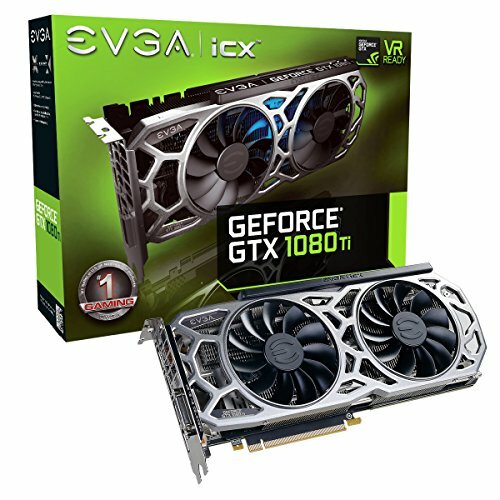 While Nvidia’s GTX 1080 Ti Founders Edition ditched the DVI-D port to increase cooling while sticking to the same form factor as the GTX 1080 Founders Edition, EVGA’s robust cooling system allows the company to return the legacy, yet well-loved connector to its rightful place on the rear of the card. Enough talk. Let’s benchmark this badass. You’re going to want to read the results for heat and Ashes of the Singularity. The GTX 1080 Ti SC2 uses EVGA's revolutionary iCX cooling technology to make the most potent consumer graphics card in the world even better. It's cool, quiet, and powerful.